Honestly, for the first time my heart goes out to you. Earlier, the constant terror attacks that your country was facing seemed like ‘Business as usual’, but not anymore. Earlier the proverbial ‘As you sow so shall you reap’ was quite apt, but today it has gone beyond just idioms and instead cries for some introspection than plain foolishness. Earlier I cared naught on what is happening in your country because I always felt, you guys deserve it. But not anymore. Not anymore because the manner in which those 140 odd kids were butchered in Peshawar, it was certainly not what they deserved. They deserved better atmosphere to learn, to grow up and to be responsible world citizens. They deserved to be fed, taught and brought up well. They deserved everything that an average kid in India, USA, UK, and Europe deserves. But because of a sizable number of Ostriches in your country, your children, not only were deprived of these very basics that they deserve but also were mercilessly killed at their alma mater. At the outset, you guys should feel ashamed and slap yourself for being such shameless creatures for such a long period of time. If not for your alter ego, at least introspect for your kids. Those kids who were killed by fanatics of your country were none to me. Hell, they even don’t belong to my country. But still my blood boils seeing so many innocents getting killed for no reason. And you know why? No, to hell with that humanity nonsense. A child is as good a world’s property as he/she is for his/her country and you have all the responsibilities in the universe to take good care of these world's assets. And what you did instead? Allowed snakes to be domesticated in your households to bite these very children in future. I advise you again. Flip a dictionary and search for the word ‘Shamelessness’ and if time permits, for the word ‘Godlessness’ as well. We may have trended #IndiaWithPakistan on Twitter yesterday but I as an individual deny standing with a bunch of shameless morons who can’t even defend their own kids. Why should I stand with Pakistan and worry for their children when they find their priorities with terrorists and terror organizations? Why should I stand with Pakistan when I see them hobnobbing with scoundrels who routinely kill your kids and my kids? Why on earth I would want to be sympathetic to a country full of barefaced individuals when they themselves are not sympathetic to their own cause? Why; just why? That said; I know it is time for unity and solidarity. I know pointing fingers won’t help in that direction. But it is also a fact that nothing worthwhile can be achieved; nothing fruitful can come out if there is a denial for truth. And the truth is – the terrorists may have pulled the triggers on your children’s foreheads but it is you who gave that gun to them. They came and they destroyed your homes but look at the irony, you only were busy building homes for those rogues all this while. They might have entered the school to create the mayhem but it is you who showed them the route to reach that school. They may have roll called the kids before shooting them pointblank but it is you who applauded them when they were doing practice sessions of similar nature in other countries. It is you who supported them when they were hurling bombs inside Taj hotel, which gave them the confidence to take the Kalashnikovs to the school premises. Do you guys realize this? Do you realize, for decades, how you people were busy digging graves of your own kids? If not then my second advice – Take your miserable fasces to the darkest possible room you find my dear Pakistani brothers and sisters and hang yourself out of shame. But before you die out of shame, you know where the problem lies? Yes, denial. You guys are in a very bad habit of denying everything, including truth. And this very dangerous ‘denial as a state policy’ has eventually brought terror into your own backyard. There are people in Pakistan who still believe that they are not the chief architects of these deaths but it is India which perpetrated such a heinous crime. Ask Parvez Musarauf or that moron Hafeez Saeed for a detailed analysis. These two fine gentlemen are not alone in making your lives miserable. There are others too. You must have heard of an opportunist wolf, the Pakistan version of Arvind Kejriwal, called Imran Khan. This man is a constant Taliban sympathizer. Since this man took to politics, all that he did is pushing his puke worthy ideology of talks with the Talibanis. Do you really talk to savage animals or eliminate them mercilessly? Now that the rogues have butchered 140 kids in the capital of the province where his party is in power, he had gone to a hiding. Dear Pakistanis, when you meet him next time, ask this dubious fella the toughest question possible. Ask him, where his gas bag proposal gone now? Why he never took the Taliban name directly while condemning this ghastly attack. I can understand his political compulsions. But does the situation like yesterday warrants vested interest take better of the ground realities? Being sympathetic to the devil for long term or short term benefits is fine but to remain ignorant in event of such barbarism, it requires a great amount of skullduggery and uncouthness, on which I am sure Imran Khan has done his masters. For this loathsomeness and this alone both Imran Khan and most of you who support him must be congratulated for successfully eliminating your country’s future. If you guys really have any shame left then leave none. I mean none. Ask your present army general and at least a dozen generals who held this office earlier, if they are as shameless as you. Ask them if their prolonged attempt at sabotaging your democracy and the country to a large extent finally bear the desired fruit or not. Ask them the difference between a good terrorist and a bad terrorist. Notorious danger to humanity like Dawood Ibrahim is well protected by your army and so as Hafeez Saeed and Osama Bin Laden till recently while your kids are getting mercilessly butchered like they belong to none. Those who attacked Taj hotel and CST are good terrorists while those who attack Pakistan people are bad. Ask them how such flabbergasting differentiations benefited your country and your populace. Ask your generals to look at the plight of each of those Indians who lost their dear ones in the hand of those terrorists, whom your army routinely gives cover fire to infiltrate across the border to India. Ask them who supplied highly nourished fodder to these Therike Talibanis to bounce back to the shape and size they are in. If you can’t ask them tough questions then let me assure you, the regrettable Peshawar incident certainly is not the last one to visit us. 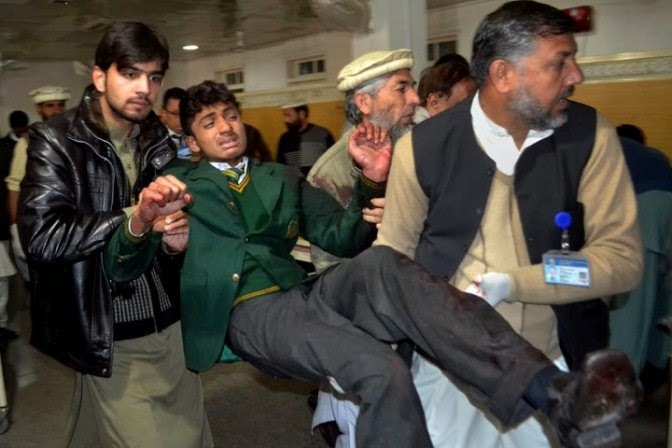 Today, it is Peshawar while tomorrow it could easily be Mumbai or Delhi and we will keep on losing our kids to the whims of these scoundrels; believe me. Don’t leave that Nawaz Sarif and your government either. They may appear sympathetic at present but their hand in the crime is exemplary. Arranging special trains to ferry people so that they can attend the bile delivering ceremony of Hafeez Saeed won’t keep your children safe. Rather it will put your entire clan in danger and it in fact has already. Had your government acted swiftly against Hafeez Saeed post 26/11, I bet the TTP chaps wouldn’t have dared to kill your kids like this. Terming such cancers of the society as ‘Non-state actors’ and running away from truth doesn’t exonerate you from the wrath of the very snakes. Ask your government on what ground they never treated the barbarism of 26/11 as an act against humanity but an act against India? Ask them, how they can sleep peacefully with blood of innocents dipping from their hands. Ask them, what Dawood Ibrahim is doing in your country when he belongs to the gallows. Ask what business Osama Bin Laden had in Pakistan to enjoy his rabid life under the protection of your army. Ask them, what they have to offer to that woman in India who lost her three sons in 26/11 attack. If you can’t ask then my third advice – kiss your kids goodbye every day before dropping them to their schools. Because you never know, when you may not see them again. Khoon Ke Yeh Napaak Dhabbe Khuda Se Kyese Chupaoge, Masumon Ke Kabr Pe Chadh Kar Kaunse Janaat Jaoge…..
Mr Cynical, could you write one article exposing double standards of our secular parties and media over conversions. They were never there when native Hindus were converted to other religions. The very idea or pricipals Pakistan was created was on hatred (towards Hindus and India). If this the case, how can you expect them to learn.. The Good Talibans have justified the butchering by producing relevant lines from their book. Do I need to say something that is obvious? 1. Consider all the really oppressed people of the world, i.e. Yazidis (now), Pakistani Hindus (last 60 years), Kashmiri Pandits (25 years), Jews (world war) etc. Please tell me how many yazidi, pakistani hindu, jew, or kashmiri pandit terrorist organizations exist today? 2. How long can we bury our heads in sand towards this pure evil of islam, which has become the favorite religion of murderers and rapists because this all is allowed in this devil's cult. 3. Islam is a poisonous ideology which robs its followers of any reason. 1. No. Our duties doesn't end at our homes, it extends towards humanity as well. As long as we let this poison expand in human society, humanity will keep suffering. And the day islam becomes the world's leading religion, the progress of humanity will stop. Don't believe me? Look at Saudi Arabia... they have everything. These people were never oppressed by anyone, in fact they freely oppress anybody other than a muslim. But still does that put them in peace and contribute towards humanity? NO. they just use that money to fund terrorists around the world. So as your duty towards humanity, you must oppose islam. So how do we do it? We dont want any violance: Good, because there is no need to violance. 1. Never ever, Let your muslim friends wear their islam up their sleeves, the moment they do that, dessert them, they are not worthy. 2. whenever you acquaint a muslim, make it fairly clear that his/her religion is not holier than anybody else's and there will be jokes mocking islam. This will test their tolerance. 3. To all the muslims by practice (beard, salwar, namaz etc), cut them off economically. Its your money, dont pay it where it may go to some terrorist organization. 4. Never, ever let this thought come to your mind thoughts like "All religions are same", "All of them teach peace", "We can not be same as them" etc etc. Remember, All religions are same, but not Islam, for it is not a religion. It is a totalitarian political ideology of extreme violance and discrimination, and must be ended. Very well written. Put together nicely. There have many absurdities in the movie which were unnecessary. But think of it objectively. It's difficult. Since religion is something very close to us, something personal that we take it heart when something is said about it. You took it too. Hence the post. There is a reson you wrote a post and not decapitate a few people for making a mockery of your religion. It's called time. Each religion is at a specific time today in its progress. The time it is in differentiates it from others. There are religions which are still in the medieval era which go barbaric at the slightest test, there are some which have curse words added with the names of their God or saviour and there are some which remain in the perfect, private space a religion holds in an individual's life. The thing is to know where you stand on this timeline. Soft targets, gullible lot, etc are ok if you want to stir masses on a populist front, but there is a subtle message here over this heinous and unholy scenes which should hold higher importance. And it is, that is why not each and every Hindu is out on the street rioting. This is a fact that cannot be unseen. Hinduism has progressed from a barbaric stage (except for a few), to a more accommodating mindset. Yes, there is a multiplicity of religions in India, but why Hinduism was allegedly targeted and shown need for reform? Because it can take it and make changes with the time without getting into the medieval mode. The place in the timeline has shifted out of that era. And it will move further even if some people want it to stay there. Saying this, I do not mean to promote such activities which hurt the sentiments of some people. It's very shameful. But it's the message that counts, not the messenger.